With a few mouse clicks you can create movies from an animation. Right click on the 3D animation window and select Create Movie. • YouTube: Movies in mpg-format for placement on YouTube. • Avi: Movies in avi format for use in movie editing software. • Windows Media Video: Movies for the use in Microsoft programs (e.g. Powerpoint). 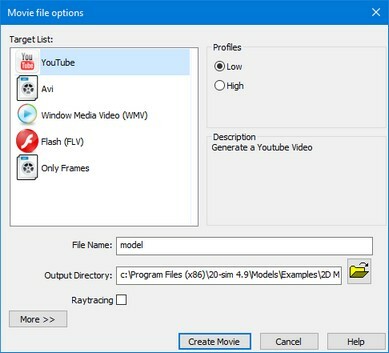 • Flash: Movies in flv format for the use on Internet sites. You can create movies with three profiles (low, medium, high). The corresponding sizes are shown in the table below. Ray tracing will add shadows and mirror images to a 3D Animation. However ray tracing cost a lot of processing power. If you select the option Ray Tracing, the quality of your movie will be improved, but the time to create it will increase tremendously. Choose the More button if the standard profiles are not up to your demands. You can set the size of a movie, the frame rate and speed up or slow down the speed. Click the Create Movie button to create a movie. The movie will be stored in the output directory that you have specified using the filename that you have given.